In the recent DARPA Robotics Challenge (DRC) held in Florida, one of the entries had an ape-like structure but moved like a spider. The entry, called RoboSimian, was built by engineers from NASA’s Jet-Propulsion Laboratory (JPL) and Stanford University. The robot stands 1.64 meters tall and was created to assist in dangerous situations, ranging from a nuclear meltdown to the aftermath of a bomb explosion. Thanks to robots like these, humans will not have to risk their lives going into such dangerous environments. RoboSimian has cleared the initial rounds of the DRC and is going to be participating in the finals at the end of this year. The RoboSimian team had to go against 15 other teams to get a place in the finals. Initial rounds included basic tasks such as climbing ladders, opening doors, turning wheels and clambering over obstacles. The more complex tasks involved removing debris, connecting a fire hose to a tap, breaking through a wall and even driving an emergency vehicle. The robot weighs 238 pounds and has 28 degrees of freedom allowing for mobility which lets the robot fold into a relatively small volume, making it easy to transport. 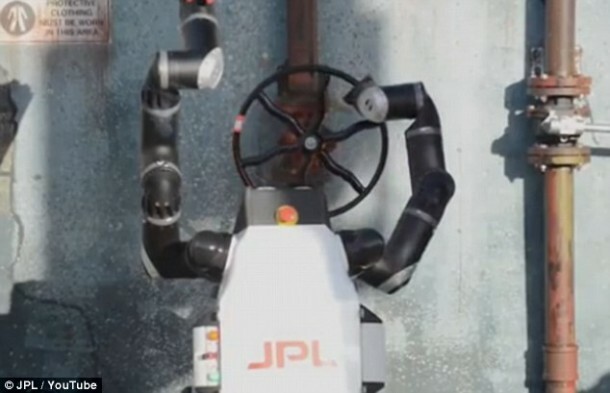 The four arms are used for multiple purposes such as, supporting the robot’s weight, lifting objects, opening doors and allowing the RoboSimian to walk like a spider. Two of the arms have three fingers each to grip objects, open doors and perform other tasks where human hands would be required. RoboSimian is built to be controlled remotely by humans using a monitor, keyboard and mouse. The ape-like droid came in 5th at the initial rounds of the DRC with 14 points. The competition was conceived following the nuclear meltdown in Fukushima, Japan. RoboSimian, along with the other finalists, provide us with a glimpse into the future of robotics and how they can be used to help humans.